Samsung is developing a game-changing screen with under display camera! Home / mobile / news / samsung / Samsung is developing a game-changing screen with under display camera! 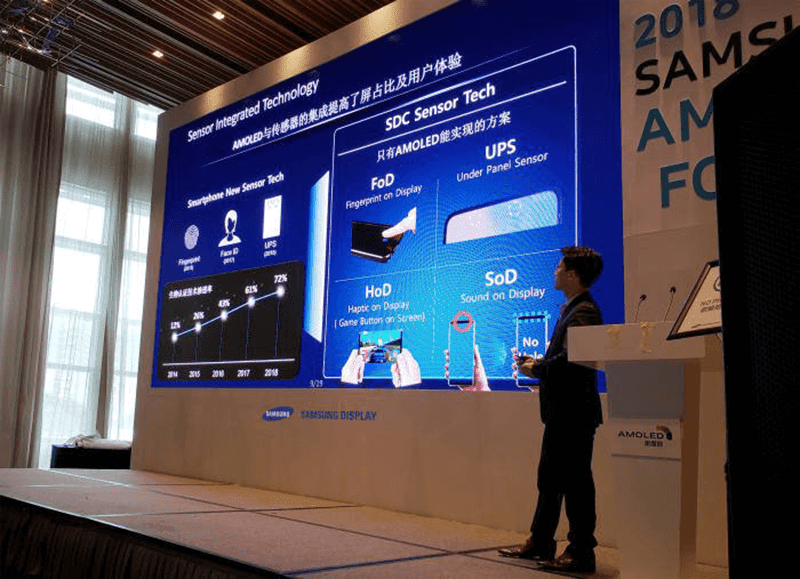 At the 2018 Samsung OLED Forum in Shenzhen Marriott Hotel China, the South Korean tech giant showcased a very promising screen technology. No notch needed for a full bezel-less experience! It will be an AMOLED screen with Sensor Integrated Technology. It will feature a Fingerprint on Display (FoD), Under Panel Sensor (UPS), Haptic on Display (HoP), and Sound on Display (SoD) technologies. The Fingerprint on Display (FoD) should work like the In-Display fingerprint sensor found on Vivo devices. The Under Panel Sensor (UPS is the more interesting tech here as it will have the selfie cameras under the display which will eliminate the notch. It will also have Haptic on Display (HoP) to provide Game Button on the screen which should provide a vibration when an item on the screen has been touched. Lastly, it will have the Sound on Display (SoD) solution. We do not know the exact function of it yet. But, I won't be surprised if it will be able to emit sound from the screen itself just like the some Sony Bravia TVs. Overall, it is a very promising piece of technology which could change the game. Hopefully, we will see it soon. On the upcoming Galaxy S10 or Note10 please?